Ifo Apple Store reports that the Court of Justice of the European Union over-ruled a refusal by the German patent court to approve the trademark. In its ruling, the Court of Justice said the trademark hinged on three issues: the trademark must constitute a sign, be capable of graphic representation, and be capable of distinguishing the ‘goods’ or ‘services’ of one undertaking from those of other undertakings. The […] court ruled the design met all three criteria of EU trademark law, and approved granting trademark status. The stores are in the process of getting a slightly different look as Apple revamps the backlit visuals with ones inspired by its recent ad campaigns, along with a new organizational structure as Angela Ahrendts prepares for further international expansion. Ifo Apple Store also reports that Apple is likely to open its 38th UK store next month, in Edinburgh, Scotland – which we first mentioned back in March. The store is in the heart of the Scottish capital, on Princes Street. The store is rumored to be set to open on 2nd August. 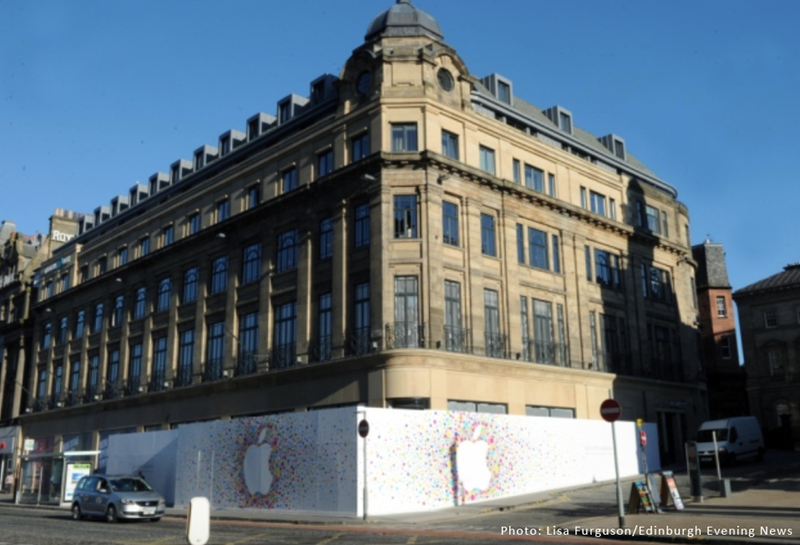 Apple already has three existing stores in Scotland, two in Glasgow, one in Aberdeen.